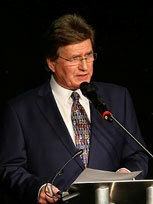 Mark Jones is an award-winning broadcaster and author. Mark Jones has worked for many years as live MC for Sky Sports Masters Football Tournaments around the world, and hosts prestigious award ceremonies and events across the UK and Worldwide. Mark Jones happily admits award ceremonies and sporting dinners are his specialist subjects; in the case of the latter, he gets to meet his heroes, gets paid, and (more importantly), he gets fed! Mark has compèred thousands of events over the years, working with many sporting heroes, including David Beckham, Andrew ‘Freddie’ Flintoff, Sir Geoff Hurst, Gordon Banks, Frank Bruno, Ryan Giggs, Graham Gooch, Gianfanco Zola, Pat Cash, Sir Ian Botham, Sir Alex Ferguson and many, many more. Mark even hosted a successful ‘sportsmen’s-dinners-for-the-troops’ tour across war-torn Kosovo in 2000 with England World Cup winners Alan Ball and Jack Charlton. In just one 12 month period, Mark hosted events around the world, including visits to Brunei, three visits to the United States, Malaysia, twice to Portugal, Germany and Switzerland, plus Hungary and dozens of events across the length and breadth of the UK. Mark has hosted Manchester United’s & Aston Villa’s Player-of-the-Year awards & hundreds of other prestigious awards ceremonies, such as the MBNA Football Awards at the Point Conference Centre at Lancashire Cricket Ground. He’s been regular live MC for the Masters’ Football Series for over a decade, (shown live throughout Europe on Sky Sports) & for the Masters International Tournaments in Dubai, UAE; Kuala Lumpur, Malaysia (twice); Brunei & Macao, China. During the 2011 South East Asia Tournament, he also presented all the live TV interviews. Mark has often been heard as Everton’s match day announcer at Goodison Park (he’s done the same for Liverpool and Tranmere Rovers too). An avid sports fan, (the green on his TV wears out before any other colour) Mark has covered Rugby League too, at World Club Champions St Helens’ ground, plus Warrington Wolves and all Leeds Rhinos’ home games, add to that list, cricket at Old Trafford, for Lancashire CCC’s home games. Mark was featured on Channel 4 and Sky Sports on the ODI cricket Internationals, Test Matches and County games around the UK and presented all the televised pre-match interviews with cricket legends Sir Ian Botham, David Gower, Michael Holding, the late, great Richie Benaud and ‘Bumble’, David Lloyd. He’s covered Manchester United, Celtic and Liverpool’s pre-season American Tours for UK radio; on that fateful morning of 9/11, he was only a few blocks away from the World Trade Center Towers in Lower Manhattan. He spent most of that day in front of the Towers as a Salvation Army volunteer helping the NYPD and NY Fire Department rescue services. For the rest of that week, he reported ‘live’ from Ground Zero for UK radio. 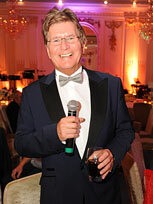 Mark Jones is one of the most experienced radio presenters in the UK. Starting in his hometown at BBC Manchester, he graduated to Liverpool’s Radio City and won numerous awards, including a prestigious Sony for his hosting of Michael Jackson’s Aintree concert, (the ‘biggest solo concert in history’) where he entertained a crowd of over 125,000. He also hosts the main stage every year at the Mathew Street Music Festival, which has regular attendances of around 300,000. Mark has regularly won ‘Regional Presenter of the month' awards and various accolades from the Variety Club of Great Britain, where Mark has been Barker for many years. After several very successful years at Century FM (now Smooth Radio), where he broadcast on both their huge North West and their East Midlands regional stations, Mark returned to Radio City’s Magic 1548 in Liverpool, to host a daily UK-networked programme. He’s also heard regularly on Manchester’s Magic 1152 (formerly Piccadilly Radio). Mark even spread his experienced wings (and tonsils) overseas and featured on American radio stations WEFT and Q-96 in Champaign, Illinois, a city where he was invited to host both the 2010 and 2011 black-tie American Heart Association Fundraising Dinners (see showreel on website). Not limiting his talents to just radio, Mark has written and published several books, including the best-selling ‘Mark Jones’ Birthday Book’, which became the definitive UK Radio reference book.